Science, technology, engineering, arts, and math—STEAM&mdash;explorations are crucial for laying a solid foundation for later learning. 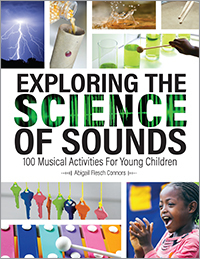 Explore the science of music and sound using materials easy to find for a preschool classroom. Children will use their bodies to create sounds, explore the relationship between size and pitch, investigate how tempo affects the way we listen to sounds, create musical instruments, and much more. From the drops of rainwater to the tinkling of wind chimes, the science of sound is all around.